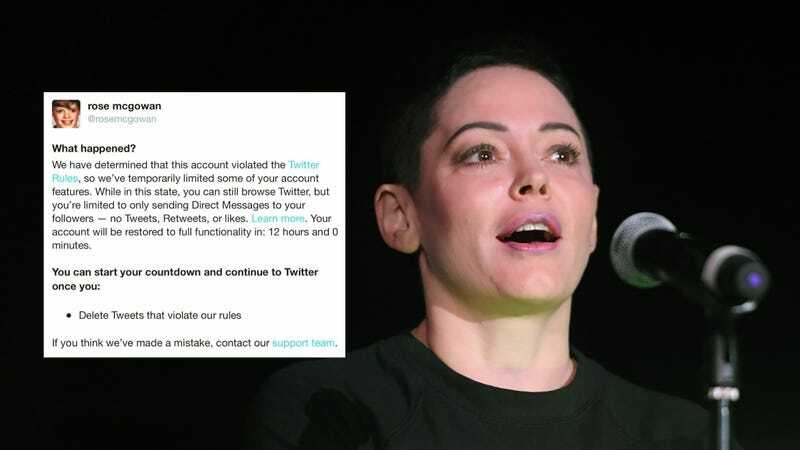 Actress Rose McGowan was “temporarily” suspended from Twitter late Wednesday night after posting at least one tweet that “violated” their rules. In an Instagram post (screenshotted above), McGowan shared the email from Twitter explaining that she would be limited to DMs (“no Tweets, Retweets, or likes”) until deleting the problem tweet. But which tweet is it? The New York Times reports it’s “not clear which tweets had resulted in the suspension,” but two in which she calls Ben Affleck a liar and claims everyone knew about Harvey’s behavior are still up. So here we are, with an alleged victim of Harvey Weinstein’s harassment being temporarily silenced by the hell we know as Twitter while you know who is still tweeting freely about wanting to cripple the free press. Update, 12:55 pm: Twitter has clarified that the tweet in question contained “a private phone number,” which violates their terms of service. Her account has been returned to full use.